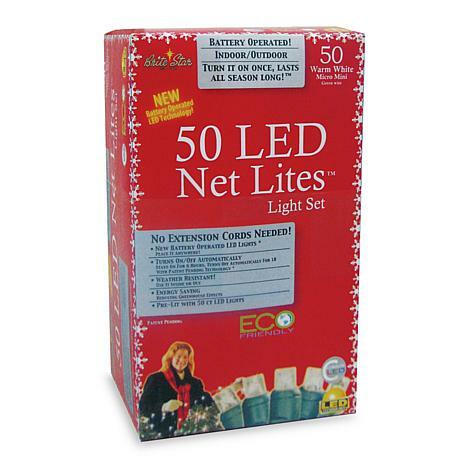 This set of 50 battery-operated LED lights are of a warm white color and form a net perfect for hanging over bushes or drapes. Strung on green wire, this set comes with a 4" lead cord and 6" spacing between the micro LED bulbs, which use less energy than other incandescent bulbs. Requires 4 D batteries, not included. These lights are far too expensive for their quality. When lit, they are dull, and they take 4 D batteries, which makes they expensive to operate. I am going to send them back to HSN. 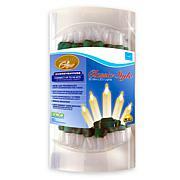 I have net lights that are battery-operated and on timers, which I purchased from another shopping channel that are far superior to these.